When Will I Get My Response Cards? 500 to 5,000 Response Cards: Ships or ready for pick up in 2 business days from proof approval. Under 500 Response Cards (printed digitally): Ships or ready for pick up in 1 business day from proof approval; Rounded Corners requires 1 additional day. Over 5,000 Response Cards: Ships or ready for pick up in 5 business days from proof approval. Response card printing can make your life easier when you’re planning an event. And the reliable online response card printing service of 48HourPrint.com gives you the peace of mind of high quality response card printing at prices you can really afford. Plus, you also get the benefit of our industry-leading 48 Hour Turnaround Guarantee for quantities of 5,000 or fewer C1S response cards. Response cards streamline invitation responses and customer feedback. 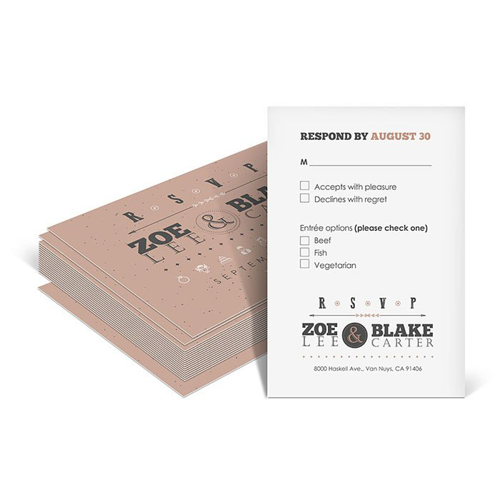 Response card printing allows your guests to easily let you know if they will be attending your wedding, anniversary celebration, holiday party, or corporate event. Response cards are also a great way for customers to share comments about a restaurant, participate in a survey, or fill out information for a sweepstakes, raffle, or other giveaway. In planning your response card printing, remember to order response card envelopes too! Preserving the environment is important to 48HourPrint.com. Our response cards are printed on recycled cover stock, which delivers excellent response card printing results on stock that is brighter and more uniform in color. Recycled cover stock is our standard stock, at no extra cost to you. Our two-sided response cards are printed in full color on both sides, with your choice of C1S (coating on one side) or no coating at all. Review our response card templates for layout guidelines that will help keep your print job on schedule.